Kluczynski, Girtz, Zamler & McCubbrey is an established and respected practice located in Southfield, Michigan. While we specialize in workers’ disability compensation defense, other areas of practice include subrogation, liability defense and corporate law. We have an associated professional corporation in Kluczynski, Girtz & Vogelzang located in Grand Rapids, Michigan. Their website is KGVLAW.com and feel free to browse same. The Kluczynski, Girtz, Zamler & McCubbrey law firm was established by Robert A. Kluczynski in 1978. The firm commenced as Kluczynski & Girtz and was born from the desire to be client driven and to provide hands-on expert and cost effective litigation defense to the corporate and insurance industries. The initial firm changed to an affiliation over the years with bases in Southfield and Grand Rapids. The Southfield office became known as Kluczynski, Girtz, Zamler & McCubbrey with the Grand Rapids firm becoming known as Kluczynski, Girtz & Vogelzang. In Southfield, the areas of expertise in addition to workers’ compensation defense include subrogation and liability defense. 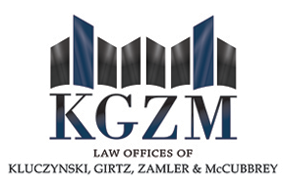 Kluczynski, Girtz, Zamler & McCubbrey is one of the largest workers’ compensation practices in the state of Michigan, especially when viewed in conjunction with the associated professional corporation, Kluczynski, Girtz & Vogelzang. We represent insurance companies and self-insured clients in all dockets throughout the state.